The first UK representative was Mr Nobby Clarke 6th Dan in 1966. Nobby [picture right] and his wife Margaret established one of the biggest Multi Art Combat Associations in the UK. The current UK president of the IBF is his son Mr. Martin Clarke 8th Dan. Martin has given a much needed updated approach to Martial Arts in the UK. The IBF UK was one of the first organisations to recognise coaching. This plays an extremely important part in the promotion of Budo sports. 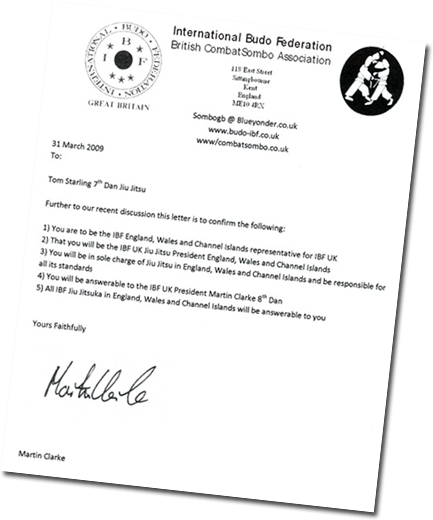 Tragically Martin Clarke pasted away in 2018 he had actively encouraged membership within the IBF UK and had brought Karate, Judo, Sombo Wrestling, Jiu-Jitsu, Combat Ground fighting, Shiai Jutsu, IBF Submission Wrestling-Belt Wrestling and Kung-Fu all under the IBF (UK) banner. Picture right Sensei John Clarke 6th Dan President IBF UK third generation Clarke to have the post.